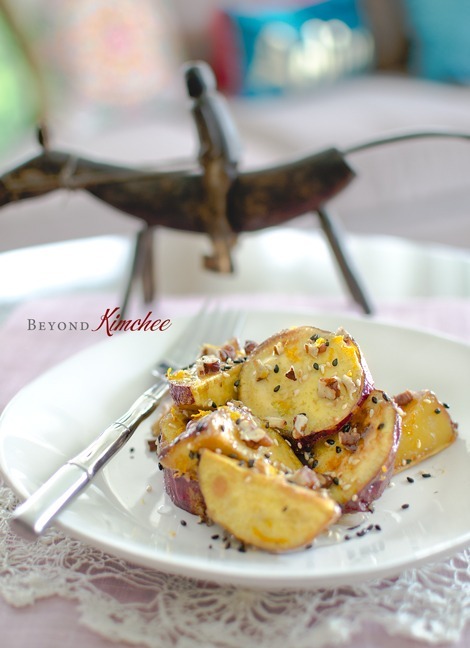 I wish…, I really really wish that my kids would eat “sweet potatoes”. 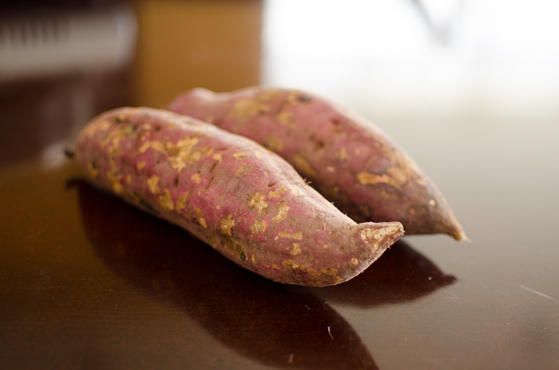 What’s wrong with sweet potatoes that they would not like about? 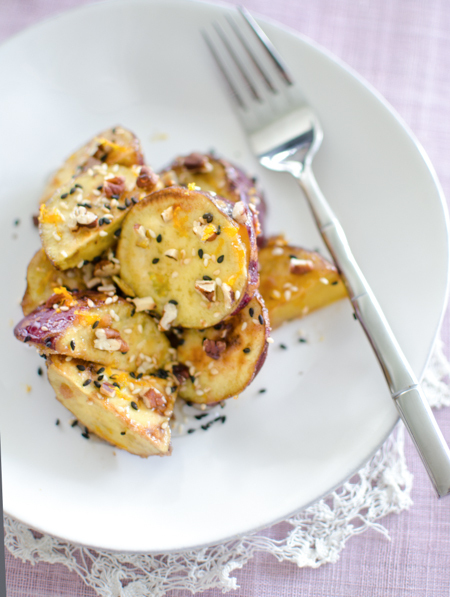 They love their potatoes… and sweet potatoes are like potatoes but only sweeter, right? Don’t kids usually love anything sweet? My kids like their sweet corns or sweet peas. Then why not sweet potatoes? I just don’t get it. The only way my kids would eat sweet potatoes is hiding the flavor and the texture in recipes such as sweet potato doughnuts, rolls, or in a dessert form with cream and spices mixed in. Sweet potatoes are such a power food that gives so much health benefits, I really want to use them without making into dessert with high in fat and sugar. Therefore this time, I made a little lighter version of caramelized sweet potato snack dish, the Korean style. Goguma Mat-tang (고구마 맛탕) is the name for it in Korean. It is a typical street snack food in Korea when I was growing up. However the sweet potatoes are usually deep fried first, then slobbered with simple sugar syrup. I tweaked. I used completely different method. 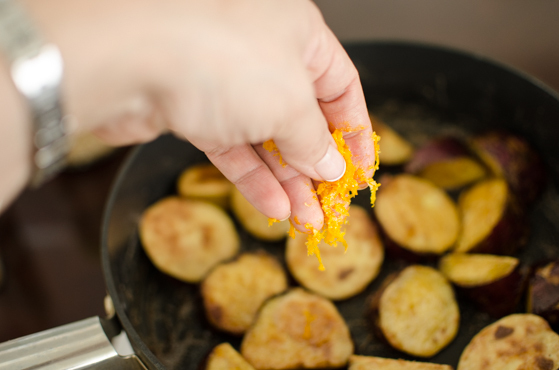 I also added a little cinnamon and orange zest to perk up the flavor of sweet potato and it gave a pleasant balance. Here are beautiful looking sweet potatoes. Clean and DRY them well. 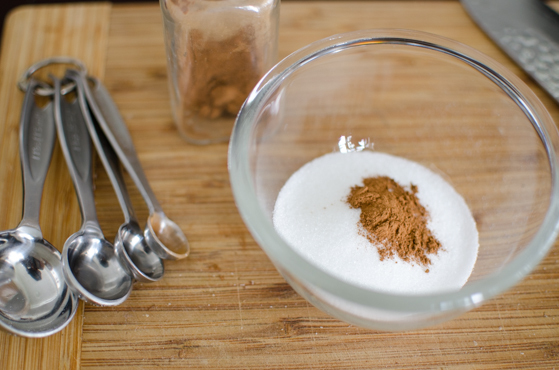 Mix sugar and cinnamon = the good old cinnamon sugar. You can adjust the amount of cinnamon for your liking. 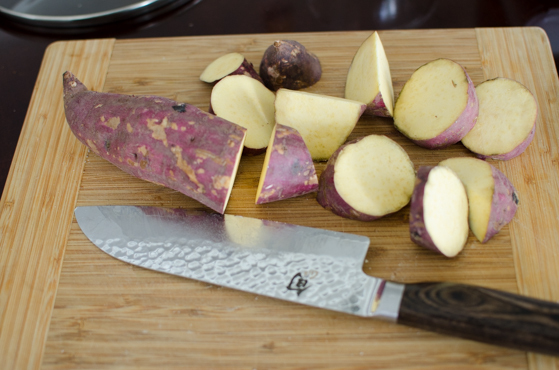 Cut up the potatoes in slight irregular shape (but similar in size) chunks, about 1″ at the thickest part. Why irregular shape? I don’t know. That’s how they always have been. Place the potato chunks in a non stick surface pan in a single layer, sprinkle the cinnamon sugar over. Cover with lid and bring the pan over med-heat. A few minutes later, when you hear a sizzling sound (most sugars are dissolved and turning into caramel at this stage), shake the pan vigorously from front to back and left to right. Make sure you hold the lid with one hand shake the pan with the other. Reduce the heat to low and let them cook more shaking occasionally, about 2 minutes. This will help to cook potatoes evenly. Resist the temptation of opening the lid. The steam that are trapped inside the pan does all the cooking so you want to keep the steam in. 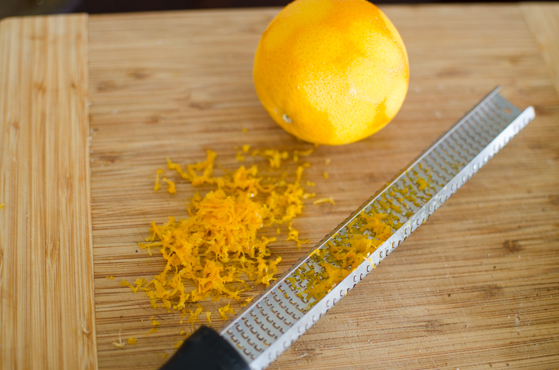 Meanwhile, zest your beautiful orange. When you see the nice golden stickiness coats the potatoes, check to see if they are tender by poking with a knife or a chopstick. The caramelized glaze should be dry sticky not runny. 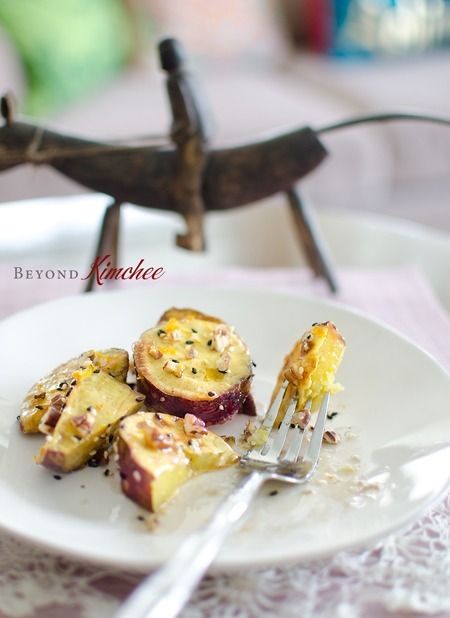 and some toasted sesame seeds and pecans…, you are ready to serve this delicious snack (or dessert). You will like the slightly crunch texture on the outside due to the hardened caramel coating, and the lovely orange cinnamon fragrance with nuttiness on every bite. My kids actually ate them. Hooray!!!! I hope yours, too. Go, sweet potatoes! Rock the world!!! 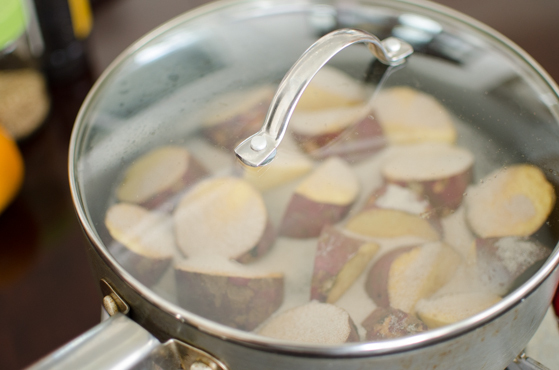 Rinse and scrub sweet potato to clean. Towel dry to remove the moisture on the skin. Cut them into about 1" thick pieces. 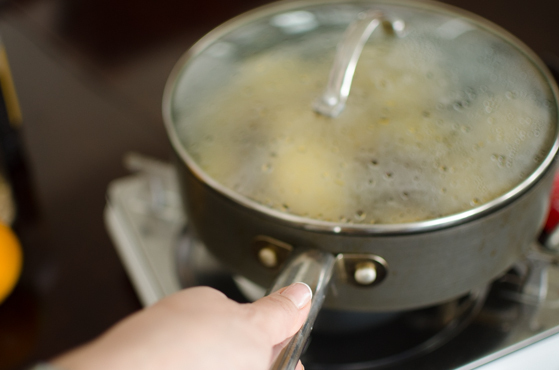 Place potato pieces in a non-stick surfaced skillet in a single layer without overlapping. In a small bowl, combine sugar, cinnamon, and salt. 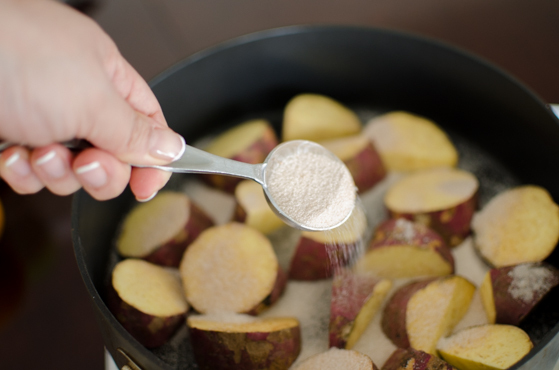 Sprinkle sugar mixture evenly over the sweet potato pieces. Cover the skillet with a lid and place over medium heat. When you hear the sizzling sounds (in about 2 minutes), reduce the heat to low. Occasionally shake the skillet by holding a handle with one hand and holding the lid with the other hand. This will help to caramelize evenly on the potatoes. Cook the potatoes in this manner for 2 minutes. Open the lid and flip the sweet potato pieces to the other side. Continue to cook for additional 1-2 minutes shaking occasionally. 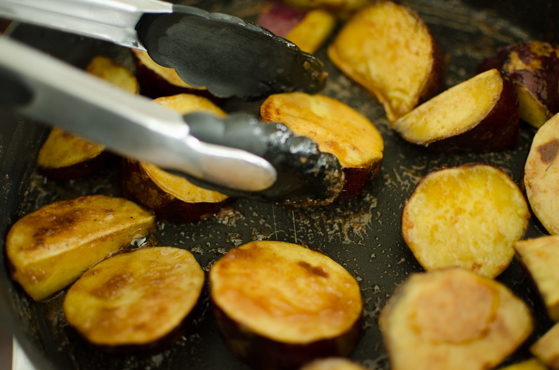 Test with a knife to check if the potatoes are tender and coated with sugar caramel. You an add the honey or corn syrup to give more shine and sweetness. Sprinkle sesame seeds, orange zest, and pecan on top. Serve warm or at room temperature. 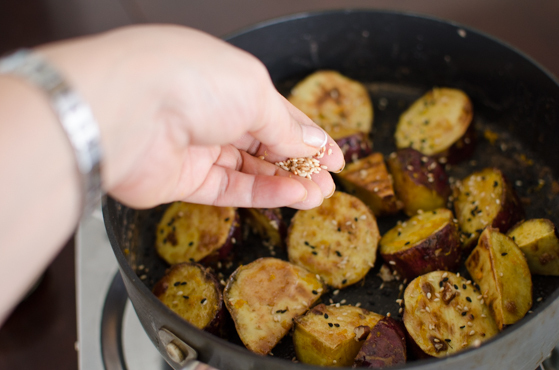 Do you use a certain kind of sweet potatoes? Japanese or the kind you find in the southern US? 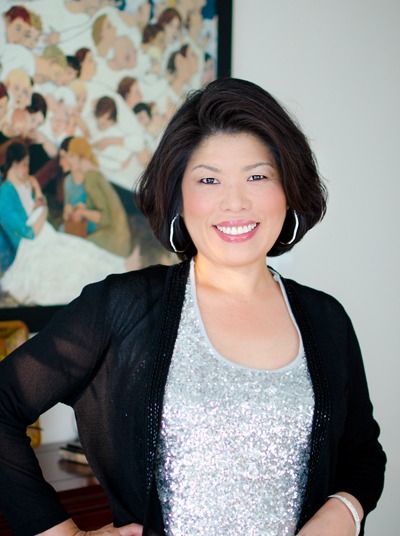 HI Irene, I used Japanese sweet potatoes. Great looking dish! I use sweet potatoes all the time, but not like this - I'll definitely need to give this a try. 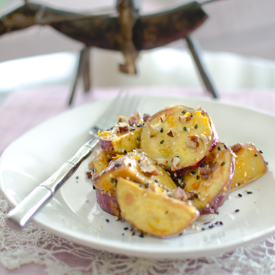 I like adding spicy flavorings to sweet potatoes (they're wonderful in chili, for example). Your kids might like them better that way. Anyway, good stuff - thanks. Hi Jiji, you will need to use non-stick surface pan so that sugar caramel won't stick to the pan too much. 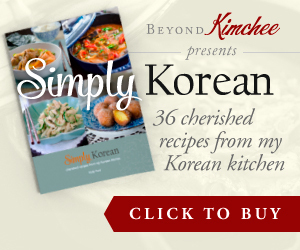 Hi Holly unni, I followed your recipe and it came out just perfect! I used a little oil though just to make it taste unhealthy as it originally is. lol. I didn't have an orange or a zester, so I sliced a thin layer of cutie mandarin orange peel instead. It was amazing! I also threw in a dot of salt for flavor. I highly recommend this recipe to all! Hi Jiji, I am so glad to hear that you like the sweet potatoes. I think adding a little salt will enhance the flavor nicely. Thanks for your comment. Have a great Thanksgiving! I would be afraid it would stick without oil. I'll give it a shot though. This looks scrumptious.